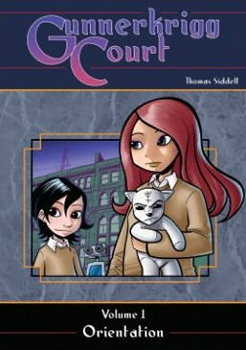 I was just wondering do you guys know a graphic novel that was about two girls in a boarding school and the main girl had red hair and her mother died in childbirth and and I think she has a wolf spirit?? Also, the other girls boyfriend turned into a bird? It was a pretty dark series from what I can remember. Thank you for your help !! I read it when I was a kid (maybe 10-13), and there were animal spirits but not many characters changed into other animals, he was more of a side story, and he did change at will. I also think that the school she went to was kind of evil, also the book was in english. Also, there was this one popular girl who always fenced with another guy she hated but in the end she got together with him. Book about 2 boys that time travel from 1980's (?) to Mayan (?) civilization with a Viking girl?